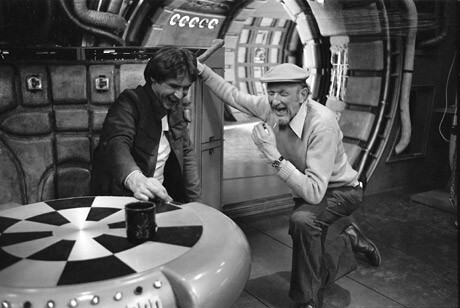 Irvin Kershner, known as "Kersh" to his friends, was an amazing filmmaker. He's best known for directing the second Star Wars film, Star Wars: Episode V - The Empire Strikes Back, but he also directed many other films, including Robocop 2. While I never had the opportunity to meet the man before his death on November 10, 2010, I recently got to talk with Noble Smith who had the rare privilege of meeting him personally. Since I'm an avid Star Wars fan, I couldn't resist asking him to tell some of his stories for our blog. Find out the surprising Hamlet connection in Star Wars, how a volcano stopped Noble from watching Star Wars and how Kershner inspired Frank Oz to become a director. Thanks for doing this interview Noble. You mentioned that you had a picture from Starlog of Irvin Kershner taped to the wall above your Super 8 camera editing system when you were a kid. What did Kershner mean to you? Yeah. That picture of Kershner with his cool tweed hat, laughing with Harrison Ford in the Falcon. He just looked so cool. So confident. He was a real movie director, you know? I wanted to be like him. But I had no idea how to be a director. After The Empire Strikes Back came out (when I was twelve) my uncle gave me a Super 8 camera and I just started shooting stuff and teaching myself how to edit the old fashioned way—with a cutter and splicing tape! I have a great story about The Empire Strikes Back, by the way. I was one of those crazy Star Wars obsessed kids whose room was crammed from floor to ceiling with memorabilia. My dad, as a special present, managed to wrangle tickets for the premiere of The Empire Strikes Back at the Cinerama in Seattle. The Cinerama was (and still is) this awesome theatre with a massive curved screen (the theater was saved from destruction a while back by Paul Allen). In 1980 we lived in Yakima, a town in Eastern Washington, a two-hour drive over the Cascade Mountains from the big city. Well, I was geeked up about seeing the premiere for about four months. I could hardly sleep at night knowing that I would be at the first showing of Empire. I would fondle the tickets and gloat. Three days before the premiere Mount St. Helen’s erupted. It was like a crazy apocalyptic nightmare in Yakima. The skies went black. We got four inches of sulfurous ash. Everyone’s cars died after getting clogged with grit. We were all stuck in Yakima for weeks because the roads were shut down! Of course I missed the premiere of Empire. And Kershner, I found out years later, was actually at that showing!! He had a summer home in Washington State and had this connection to the Pacific Northwest. He and his son Dave (with whom I’m now good friends) were there. It still pains me that I missed the premiere of Empire because of a stupid volcano. That would have messed me up too. When did you first watch Star Wars, and what was it like? Like a drug. Life altering. I gasped when the Star Destroyer entered the frame on that first shot. I wept at the end because I didn’t want it to be over. Afterwards all of the kids were running around the theater lobby, blasting each other with pretend blasters, making the “chu, chu” noise. It was like they’d been possessed. They were giving away these awesome souvenir programs at the theater because it was opening day. I took two. I still have them. I treasure them. Star Wars made me dream big. And then I got into The Lord of the Rings and that gave me the impetus to become a writer. So Star Wars and [J.R.R.] Tolkien were my two biggest influences. But Star Wars came first. How did you come to watch Star Wars the Empire Strikes Back at Irvin Kershner's home? 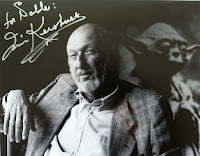 I was shooting some interviews with Kershner for his family a couple of years before he passed away at his home in LA. It was amazing to walk into this man’s house. See his stunning photographs on the walls, posters for his movies in his office, a giant Robocop sculpture, etc. And he still wore that cool tweed cap! So I had him hold a microphone and I recorded him watching Star Wars: The Empire Strikes Back in his TV room while doing a running commentary - sort of like the one he did for the Empire DVD. He talked about how he had drawn out the entire attack on Hoth action sequence himself. Storyboarded it on the fly! Everything. The AT-ATs, the snowspeeders, etc. I asked him what happened to those storyboards and he said he’d left them in a mini storage in London. But they got lost! Arrrgggghhhh! Anyway, Kersh had an amazing eye. You really saw that in his own artistic photos. He started out his career as a photographer. He also realized that old school tricks are sometimes even more effective than elaborate special effects. For example, the part where Han spurs his Tauntaun and leaves Echo Base to go rescue Luke. Well, it looks like the Tauntaun is pulling away from the camera and galloping away. But they didn’t have the ability to make the Tauntaun move. So Kersh took hold of the camera himself and moved quickly to the side as he rolled film—an old technique to give the illusion of movement. It was one of the great thrills of my life watching Empire with him. I still can’t believe I got to do that. 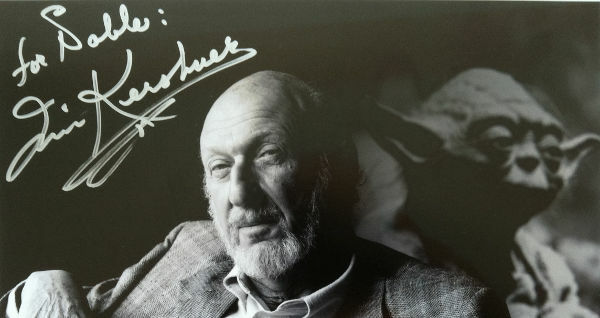 Autographed picture of Irvin Kershner "For Noble"
Wow. That sounds like a thrill of a lifetime. On a sad note, you attended Kershner's memorial. Can you share any memories of that occasion? It was an honor to attend his memorial at the Director’s Guild in Los Angeles. I met John Lithgow who had worked with Kershner on a film in the seventies. John loved Kersh and was so sad that he’d passed. Billy Dee Williams was there. And Mark Hamil. So were Lucas and Gary Kurtz. I actually sat in the back row next to Barbra Streisand who adored Kersh and saw him as a mentor. So the coolest thing about the memorial was when Frank Oz got up and told a story about how Kersh had inspired him to take the leap to become a director (this was right before Oz did The Dark Crystal). Oz was terrified of directing a film. Kersh told him that taking a chance in life was like walking into a dark room. What Kersh was trying to tell Oz was that the process of discovery and risk-taking begins anew again. And that’s what is so fun and exciting about life. That’s what Kersh was all about. And that’s why he was able to make one of the greatest films of all time. A Sci-Fi flick that could have been cheesy, but instead resonates with profound emotion. Awesome. Tell us about your new book "Wisdom of the Shire" and what you'll be working on in the future. The Wisdom of the Shire is a life guide for Tolkien fans. It’s sort of like The Tao of Pooh, but for lovers of Middle-earth and the Shire. It’s been simultaneously published in the United States and the UK, and is being translated into eight languages. You can read an interview on Wired.com’s 'Geek Dad' column with me and Ethan Gilsdorf, the author of Fantasy Freaks and Gaming Geeks. In June of 2013 my action adventure series The Warrior Trilogy is being published by Thomas Dunne Books/St. Martin’s Press. The first book in the series is called Sons of Zeus, and it’s about a young Olympic fighter who has to save his city-state from genocidal invaders. Anybody who loves Braveheart or Spartacus the TV series will dig it. Follow my blog at www.shirewisdom.com and on Twitter @shirewisdom. Thanks, Geek Twins! I love your site and your Tweets. Keep dreaming big. For more of our interviews click on this link. What do you think of the interview? What would you have liked to ask Irvin Kershner? Do you have any fun Star Wars stories you'd like to share? Stupid is not the word I would use for the volcano, but we;re family friendly here. LOL I LOVED this interview. Empire is by far my favorite Star Wars. Tauntuans rule! And I remember well the Hamlet scene with Chewie. Brilliant! I'm glad you love it! I might have to do a part 2. I left out a lot of great stuff. We ended up going to the Star Wars Celebration IV (in 2007) at Staples Arena that weekend and I followed Kersh with the camera as he made his way to his big standing room only panel discussion. You can read an excellent account of it here from Jason Matthews. Pat, he would have been great on the prequels or the sequels. He definitely doesn't get enough credit for, what some say, is the best of the series. That would have been cool to interview him. I don't think he gets enough credit from the public at large for Empire. They really could have used him on the prequels. Kershner opened a lot of doors for Noble. Just meeting him would be enough for me. The Empire Strikes Back was my favorite of all the Star Wars. Years ago I read a book about the making of The Empire Strikes Back. I'll have to read it again at some point. Wow, he got to record the commentary. And all those people he met because of Kershner. Empire will always be the best Star Wars film ever. Yeah, seriously. Stupid volcano! I want a T-shirt with that on it.